Faith has a roast beef and cheese sandwich on Nature's Own Honey Wheat, cut into a heart. I had a bit of cheese leftover from something else, so she got an F for Faith too. ;o) To go with that, we have carrots & a cucumber flower, cantaloupe, grapes & a strawberry, and the piece de resistance, homemade fruit roll-ups. They aren't quite as red as I would have imagined, but I guess that's from using real fruit and no dyes! They are a strawberry-apple combo (real strawberries, organic applesauce that is just apples & water), with a splash of vanilla. Trust me, it smelled heavenly while it was cooking! Recipe please for those roll ups! Yeah, recipe please! Did you use a dehydrator? Or your oven? 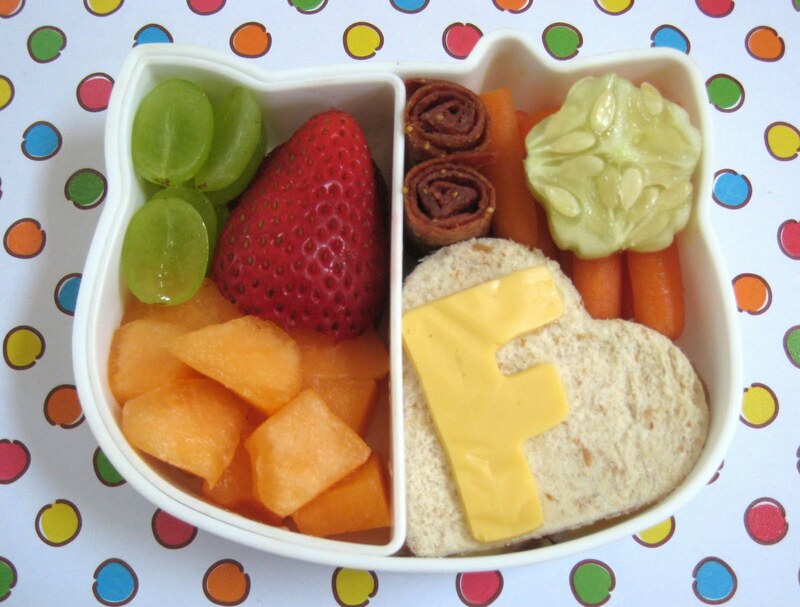 Great looking bento! After traveling to Colorado this summer for vacation and receiving some homemade fruit roll-ups I decided it's something I must try! I did a Google search and found several sites with instructions for making them without a dehydrator. They're definitely on my (growing) to-make-from-scratch list these next couple of months! What kind of letter cutters are you using? @Taka, the cutters are a set my mom gave me years ago, I think they are actually to make jello jiggler type things. They are red plastic, maybe about 1.5-2 inches in height. Looks so fun and attractive, love the initial cut out, Shannon!